Driving through the hills outside of Fort de France, you suddenly come upon an unusual sight. Mixed in with the lush tropical foliage is a building that looks like the famous Sacred Heart Basilica atop Montmarte in Paris. No, you haven't somehow made a transatlantic crossing, this is the Sacred Heart Basilica of Balata (Sacre Coeur de Balata). The Balata Basilica is a 1/5 size replica of the basilica in Paris. Like the original, the replica is in the Romano-Byzantine style. Its design is the work of architect Charles Albert Wulfleff. This church was built for two reasons. After the 1902, eruption of Mount Pelee destroyed Martinique's capital city of St. Pierre, Fort de France became the island's principal urban center and saw tremendous population growth. This put a strain on the existing infrastructure including the churches. Therefore, Roman Catholic Bishop Lequiem decided to build a new church in the outskirts of Fort de France. In addition, the church is dedicated to the memory of those who died in World War I. As a part of France, Martinique contributed some 18,000 people to the Allied forces, of whom 1,306 died. 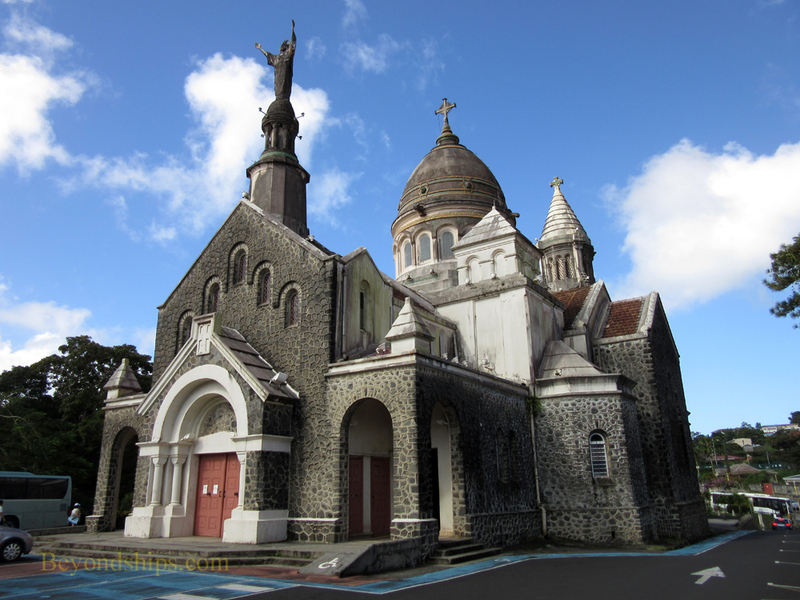 While the Parisian original took nearly 40 years to complete, construction on the Martinique version began in 1924 and the church opened in 1925. Outside, the church's steeples and domes catch the eye. The Statue of the Sacred Heart has miraculously survived two fires. The interior of the church is not as elaborate as the church in Paris. However, the less ornate style of decoration gives rise to a peaceful, simple beauty. This is not to say that the interior is plain - - it has has stained glass windows and mosaics. 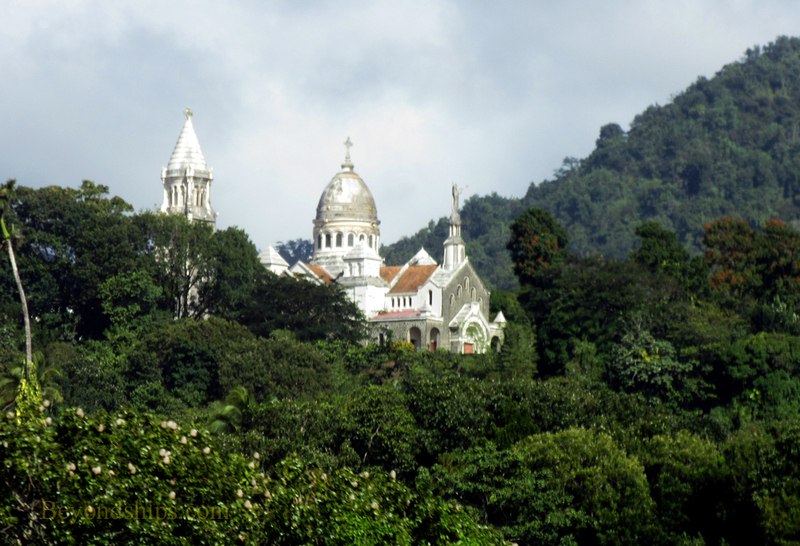 Since the basilica is located high of the side of a hill, a visit also includes panoramic views over Fort de France and the bay beyond. Also located in the vicinity of the Sacred Heart Basilica is the popular Balata Botanical Garden. 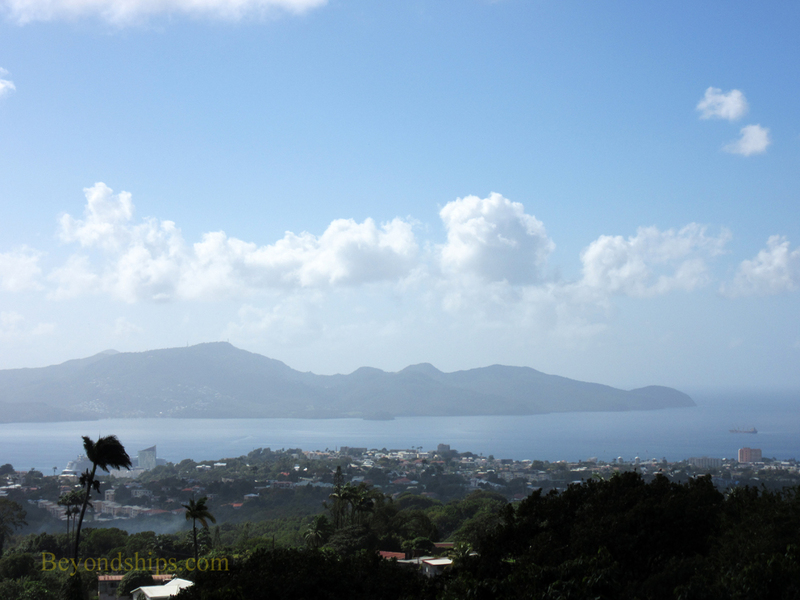 Above: Morne Bruce offers panoramic views of the capital city of Roseau and surrounding environs. Above: Scenes from the interior of the Basilica. Below: A view from the grounds of the Basilica.